HTP’s Polycurtains are a very economical choice and attach to a durable upper mesh quickly and easily. 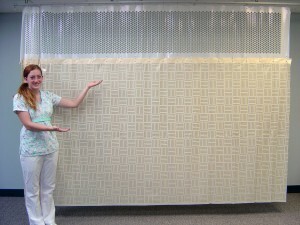 Their low cost makes them a good choice for isolation areas and other locations where infection is of particular concern necessitating frequent curtain change. Polycurtains quickly and easily attach to mesh, no ladder or stools required.